Join us on one of our Isle of Skye expeditions where we explore the island’s dramatic, remote and inaccessible coastline and wild camp as we journey. Located in the far North-West of Scotland, Skye was recently voted one of the best islands in the world by National Geographic magazine. The island is famous for stunning scenery dominated by the Cuillin Mountains. Its wild coastline is exposed to the weather that comes in from the Atlantic Ocean, and tides squeeze through narrows and around impressive headlands giving rise to interesting and challenging conditions. We have two types of expedition: one lasting 3 days (2 nights) which is geared to improving / intermediate kayakers and based on South Skye; our 5 day (4 night) expedition is suited to intermediate / advanced kayakers looking for a little more adventure. 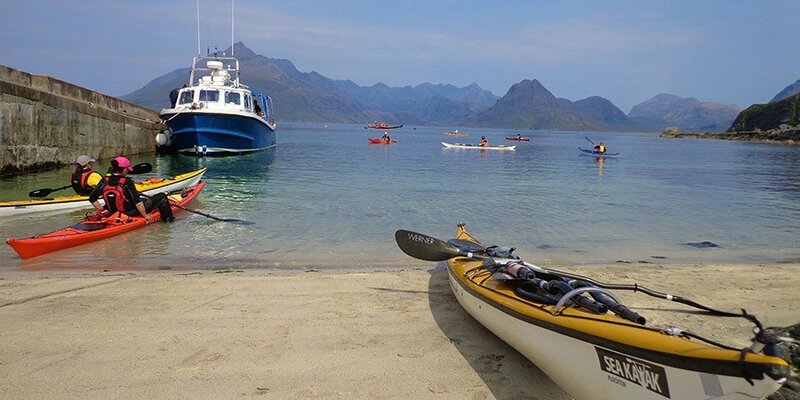 Our 5 day expedition could take in a circumnavigation of both Rona and Raasay, or perhaps an exploration of Loch Bracadale and some of the dramatic coastlines to the west of the island. Accommodation is wild camping and self-catering. The legendary Sea Kayak Plockton flapjack will be provided for elevenses!